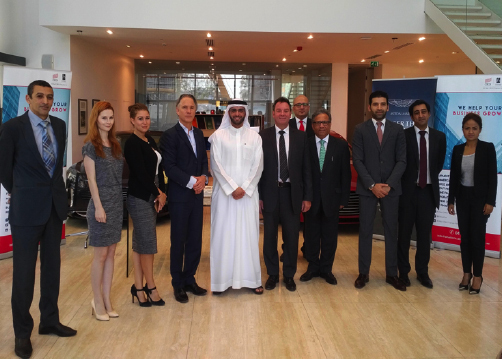 Dubai, United Arab Emirates, May 2016: Al Hail ORIX Finance PSC, the leading finance player in the United Arab Emirates, and Aston Martin Limited, one of the most prestigious car manufacturers worldwide, announced signing a strategic partnership to finance Aston Martin luxury cars within the UAE retail automotive industry. The mutual cooperation agreement signed between the two leading organizations will tailor to the local retail market catering towards salaried individuals and business professionals holding an establishment within the UAE. This strategic partnership will offer the sought-after support in financing the renowned brand’s luxury cars and will further enhance market penetration by creating new opportunities within the UAE retail automotive industry. The agreement was signed by Aston Martin Limited’s Regional Director Mr. Neil Slade, Al Hail ORIX Finance PSC’s Director Mr. Mohammed Al Mazrouei and Al Hail ORIX Finance PSC’s CEO Mr. Arshi Islam, delivering well-needed retail and financial solutions for today’s increasingly challenging arena. Commenting on this strategic cooperation, Mr. Mohammed Al Mazrouei, Al Hail ORIX Finance PSC’s Director said: “Partnering with Aston Martin is a significant step for Al Hail ORIX to highlight our successful contribution towards the UAE retail market, where we will further enhance our business portfolio amongst our successful diverse financial products while contributing to the economic development of the UAE”. Elaborating on the signed agreement, Aston Martin Limited’s Regional Director Mr. Slade added, “Our new partnership will support Aston Martin’s business growth plans within the UAE; we look forward to continuing to strengthen our regional presence and to future successes”. Al Hail ORIX Finance PSC is a joint venture established in 2002 between Al Hail Holding LLC and ORIX Corporation Japan, and is providing financing for movable assets to all productive sectors in the UAE including industrial, healthcare, construction, medical, logistics, marine, power & energy, food & beverage, with particular emphasis on development of the SMEs sector in UAE.